The product-limit estimator is used in a number of instances in the PHREG procedure, such as to transform the time values in the ZPH option in the PROC PHREG statement. The product-limit estimator is also used to construct the weights in the inverse probability of censoring weighting (IPCW) techniques, which are adapted to fit the proportional subdistribution model of Fine and Gray (1999) for competing-risks data and to assess the predictive accuracy of a model (Schemper and Henderson 2000). Although the product-limit estimator is the gold standard for estimating the survivor function of right-censored data, it might not be meaningful for right-censored data with left-truncation, as illustrated by Example 4.3 in Klein and Moeschberger (2003). In their example, 94 men and 365 women passed through the Channing House Retirement Center between January 1964 and July 1975. The outcome is the time to death, using the natural metric of age (in months). The following statements use the PHREG procedure to save the product-limit estimate of the survivor function for each gender in the data set Outs. For each gender, the number of subjects at risk and the number of deaths at each death time are captured in the data set Atrisk. By merging these two data sets, Outs and Atrisk, you can conveniently display side by side the number of subjects at risk, the number of deaths, and the product-limit survival estimate at each death time. Figure 85.18 displays two product-limit survival curves, one for women and one for men. The survival probabilities are tabulated in Figure 85.19 for women and in Figure 85.20 for men. 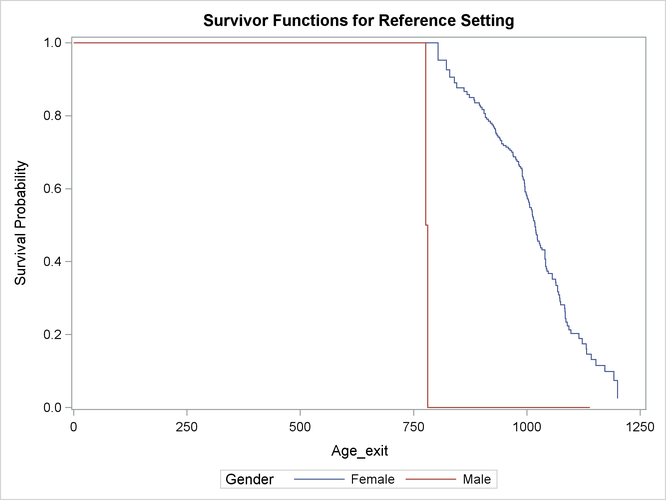 Although the survival curve for women does not appear unusual, the survival curve for men looks odd, because the curve drops to 0 at 781 months even though the majority of men survive beyond 781 months. At 781 months, the risk set consists of a single time to death, rendering the product-limit estimate as 0 at 781 months and thereafter. The product-limit curve for men for these data is meaningless. Klein and Moeschberger (2003) suggest using only those observations in which the value of Age_exit exceeds 781 months. PROC PHREG currently makes no attempt to circumvent the problem of the invalid product-limit estimator for left-truncated data.